The definition of éclat is “a brilliant display or style”. The definition of éclat is a brilliant display or style. At éclat building co. we pride ourselves on renovating and building homes with warm, simplistic and sophisticated éclat. We value the personal relationships we build with our clients. Which is why you’ll work with the same builder from start to finish on your renovation project. Andrew Marer, company director and builder, will be with you through every step of your renovation journey. As your main contact, Andrew will listen to and adapt your concept to ensure the design and quote meet your needs. He’ll be there every step of the way from daily oversight to final delivery. By ensuring one builder is across your project from start to finish, you can be confident your renovation will run smoothly and your vision for your home will become a reality. At éclat building co. we specialise in home renovation projects. Our goal is to create a rewarding and enjoyable renovation experience for you. We pride ourselves on customer service, communication and creating lasting relationships with all our clients. Hear more from our previous clients. 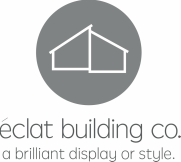 éclat building co. focuses on high quality workmanship and products. We source products and trades from Brisbane’s leading suppliers and service providers. Because we use the best products and tradesmen we offer our clients a seven year guarantee. At éclat building co. we know how important your house is and we are confident that together we can create the perfect home to meet all your needs. Whether you're looking at extending your home, giving your house a makeover or updating your kitchen or bathroom, we want to work with you. Contact us today and add some éclat to your home.